‘En Garde’! We have all heard these familiar words from smartly garbed sportsmen in their white jackets after saluting each other, their foils at the ready and their masks tucked under their arms. And we have seen duels in the Olympics and in movies like the “Princess Bride,” where handsome men have dueled to the death protecting the virtue of beautiful women, whilst swinging from chandeliers, wielding their swords, and at the same time parrying to defend themselves. This practice, known as fencing, is probably one of the oldest physical arts in existence. It sprang directly from the duel, and has been around since there has been war. Originally a type of combat, it was recognized for many hundreds of years as a means of settling questions of justice or of vindicating a grievance, and then, in the early 1900s fencing became a popular sport appearing in the United States. Three different weapons are used for this particular recreation, the foil, the epee and the sabre. The foil was first introduced as the practice weapon and is a light sword; the epee is the dueling sword and the sabre is a weapon of cut and thrust. When this sport is being played, it is performed upon an area known as the ‘piste’ and the fencer is usually attached to an electrical apparatus that is able to signal the arrival of hits. In competitive fencing the choice of the right stroke must be combined with the ability to execute it not only correctly, but also at the right moment and at the right speed. Co-ordination of mind and body is the secret of success; to think and act must be like one flash of lightning. Galen White, a 16-year-old student of Perrish, has reached level three and would love to be a part of the next Olympic Games. White has been studying for four years and loves being able ‘to control her opponents’ and admits that it helps her put ‘reason before emotion’. Many of the younger students love this sport as it is unique and not many people participate in it. They also acknowledge that it’s fun ‘poking at one another’. Fencing is a truly international sport increasingly being practiced thoughout the world, and is a skill of the greatest antiquity with centuries of tradition behind it. 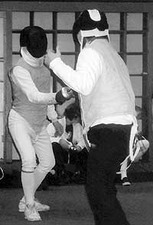 Students must practice the various fundamental movements of fencing until they become almost automatic reflexes. The “on guard” position, the parries, the simple attacks, the advance and retreat, the lunge and recovery must all be learned and can be acquired only by perseverance and instruction from able fencing masters. Looking for an elegant and aerobic sport that is similar to a physical chess game, one that keeps the body supple and strong? Consider fencing. This refined, classical pursuit could be just what you’re looking for. Or, ‘The Theory and Practice of Fencing’ by Julio Martinez Castello.